PURE gorgeous, you will pat your own back for picking it out! It hung easily, and added so much beauty. I love everything about this light and the shades gave it elegancy! · This light is not damp rated. Fixture: 29.5 inches in Diameter x 23 inches H; Overall: 29.5 inches in Diameter x 63 inches H; shade: 5.9 inches in Diameter x 5.1 inches H; ceiling plate: 5.1 inches x 1.2 inches H.
Once the fixture was installed, it looked good. However, the ordeal to assembly and wire the fixture was a nightmare. Eventually hired a professional who found the assembly to be difficult. One light shorted out after 3 days. Again, professional was called back to repair which added to the cost. The lampshades originally looked good. Began with lower wattage light bulbs than recommended. But after 3-4 weeks the glue on the shades became discolored. Now looking to replace shades. More cost! The fixture looks good but this was more of an ordeal (hiring professional), time consuming and added purchases than I had anticipated. I bought this fixture and really like it! It was well worth the money. It is simple yet elegant. The shades are a linen/beige color and very neutral. If you can install a ceiling fan you can install this light. My husband had no trouble at all! This light is not as difficult to put together as others would have you believe. Maybe you'll spend 15 minutes if you're handy at all. One thing of particular note is the requirement of "E12" bulbs-I'd like to save everyone else the hassle of questing for them-just buy CANDELABRA base bulbs-they have the tiny screw end and can be purchased anywhere including the grocery store. We used (5) 40 watt bulbs and the dining room is incredibly bright. I love this fixture and would recommend it to anyone. Didn't give it 5 stars because we wasted a day and a tank of gas looking for those "E12" bulbs. This light would be fine to update a home for staging but I would not be happy with it as a permanent fixture in my home. The shades were the nicest feature, but I would suggest they are more ivory than gold as the description states. Assembly was not fun, there are a lot or parts. But it's not rocket science, I had it together in less than an hour. The arms would not tighten and the overall quality was not good, but Overstock customer service was great and accepted my return with no problems. I had ordered this to use with the Iron 8-light chandelier. That light was much higher quality and I would have kept it except that I wanted the lights in the 2 rooms to be the same design. If you're trying to decide between this and the 8-light, spend the extra money and get the 8-light, it's much higher quality. This fixture came un assembled. If we had no electrical experience we would have had to return it due to assembly difficulty. The braded metal detailing should go all the way up to the base of the light fixture, instead it is about 1 inch short. Makes the fixture look cheap! Not too hard to assemble and install, took about 2 hours total. Swapped out the candle drip covers with dripless ones that we bought elsewhere. Has a simple *** style to it that goes with the rest of our decor. We love it. We needed a light for the dining room. The room is pretty large but the table is more narrow than the standard table (3 ft). The rule of thumb to go half the width of the table would look too small for the room, so we got this one hoping the light, openness of it would work and it does! It took a couple hours to put it together and some adjusting to get the light balanced (an easy adjustment to spread and tighten the 5 arms out but takes 2 people) perfectly but the result is worth it. There is a black cord along with a silver ground wire that we looped through the chain. We also used some black flat paint (acrylic worked fine) to take the shine off the ground wire and now you really can't see it. For the money, a good light! The shades are a deep ivory which is what we wanted too. We used regular candleabra bulbs and installed a dimmer. I purchased this fixture for my living room. The hardest thing about the assembly was tightening the bolts, as there isn't much space to work with. The wiring was easy and the light looks great. A nice surprise was that the fixture came with both black and white 'collars', so you can decide on the look you want. The shades are very nice, but I decided not to use them, as I prefer the candle bulbs on dimmer switches. The fixture is lightweight and not overly sturdy, however knowing my builder used cheap material, I knew I had to install a fixture that didn't weigh a lot, so this light is perfect. Love this fixture. It looks great in my kitchen. I was looking for something black to play up the black accents I have in the kitchen. This chandelier was perfect for that. It's not too much. It's just right. The chandelier adds a touch of class to the dining area of the kitchen. I overall am really pleased with the fixture! It's very pretty and I love the look it adds to my house. I have this hanging in my dining room and it's the perfect piece. It adds a lot of class and you really can't beat the price. The shades are more of a beige color than white as it looks in the picture, but I actually like it better than just plain white. The only downside was the instructions that came with the fixture. It's pretty much just a diagram and very little instructions. It took me quite sometime to figure out how to set it up and the only reason I was able to was by playing with the pieces to see what would fit together. Once I was able to understand the setup it was fairly easy to assemble and install. My husband& I were nervous about how difficult it would be install since we have never changed out anything electrical in our house, and it ended up being really easy to swap out. I really like the fixture a lot and would defintely reccomend it, but I just wish it would have come with better assembly instructions. This took a while to put together, but it won't stay together! It loosens while hanging, so the arms of the chandelier will not stay spaced out, then the entire thing hangs lopsided. What a waste of money. This is a awesome light ~ Very nice. Better than expected. It's in a million dollar home, in the eat in kitchen. We get lots of compliments. This Chandelier is beautiful. It has an old world quality and delicate look to it. I am very pleased with this purchase. This is a lovely fixture. I love the graceful arms and size. It's a good size without looking heavy. It took about 30 to 45 minutes for me to put it together but it wasn't hard to do. I'm very pleased with it and have received several compliments. This chandelier was easily installed and looks great for the remodel project I did! Works wonderful and was reasonably priced; definitely recommended. I like the chandelier but it came in way too many pieces. What a pain to put together. Now that it's up the arms come loose and sometimes move making the arms appear unequally spaced apart. Just not a very good design. Elegant with a rustic touch. Great quality. Easy to install. Can use with or without the shades and you can't beat the price. I have purchased this twice. Very happy with my purchases. We bought two of these chandeliers, and they are beautiful!! We use them without the shades, and they give out nice light, when needed. They look expensive, even though they weren't! "What is the width of this chandelier?" The width of this chandelier is 29.5 inches. "Are the lamp shades removable? " Yes, the lamp shades are removable. "Can this light fixture be used with a dimmer switch?" Hello Fixer Upper, this fixture can be installed to be dimmable by a professional electrician. We suggest using compatible dimmable bulbs. Thanks for shopping with us! "What is the difference between #11511205 and #11387587? They look the same, only a few dollars difference in price." Hello Joann, although the model # is different for each chandelier, I am not seeing much difference in the two items. They do appear to be the same. We apologize for the confusion. Thanks for shopping with us! "Does it come in bronze?" Hello Greenday1592, we do not currently have this in bronze, we do have a similar option, you can refer to item number 16994945 to look that over. Thanks for shopping with us! It looks pretty and the price is right for me. Perfect for my new dining room, I hope. Looking for a reasonably priced black chandelier for our new dining room. "Does this come with the shades shown in the picture?" Thank you for your question tweetybirdvicky. 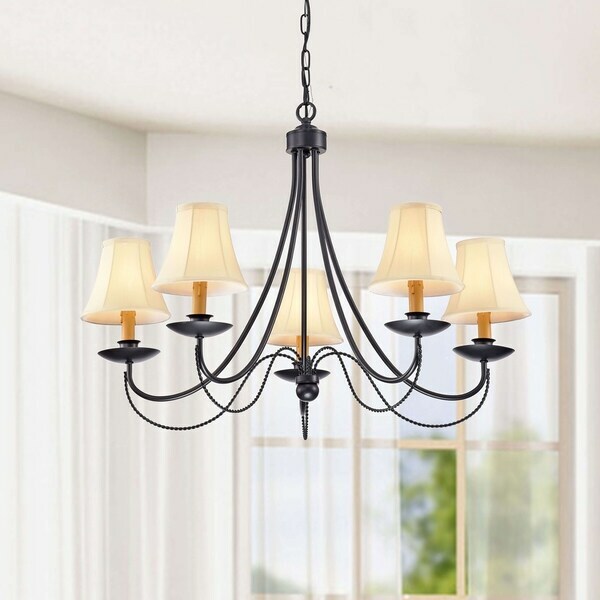 Yes, the Black Iron 5-light Chandelier comes with the shades shown. Have a great day.